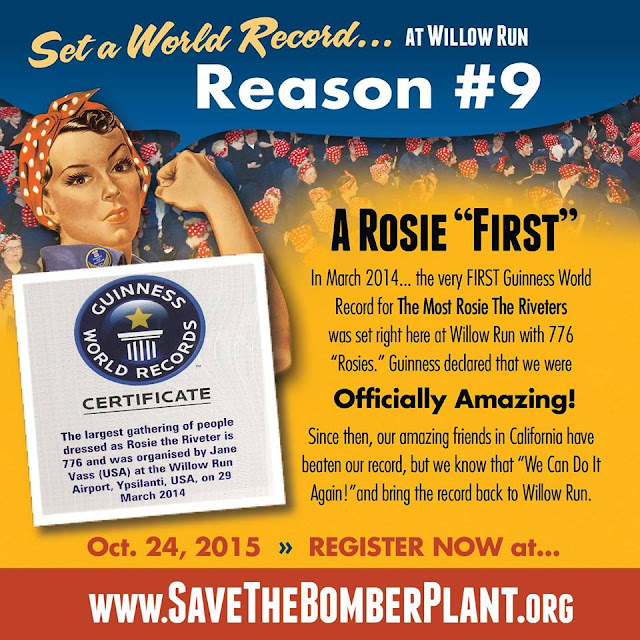 RETRO KIMMER'S BLOG: WILLOW RUN WINS THE ROSIE THE RIVETER GUINNESS WORLD RECORD! WILLOW RUN WINS THE ROSIE THE RIVETER GUINNESS WORLD RECORD! On Saturday, October 24, 2015 at Willow Run, we will attempt to take back our World Record for the Most Rosie the Riveters. STEP 2: Print out and sign the Waiver Form, and bring it to the event. Follow these costume guidelines from Guinness tomato sure you are counted as a Rosie! Stores will run out as the event approaches, so shop early! We can’t stress this enough: With as many as 2,000 women out there shopping for polka dots, please start shopping for your costume elements now. Bandanna: The correct polka-dot fabric is available from Joann Fabrics in-store and online; the fabric’s name is “Large Dots on Lipstick” and the fabric is from the “Keepsake Calico Collection.” Purchase 1 yard per bandanna. You can simply cut the fabric into a square or a strip, it does not need to be sewn. The Yankee Air Museum sells Guinness-approved bandannas online and also in their Gift Shop. There is no admission fee to visit the Gift Shop. Red Socks: Plain red soccer or baseball socks are available at stores like Dunhams and MC Sports. The Yankee Air Museum sells Guinness-approved red socks online here and also in their Gift Shop. Dark Blue Work Outfit: Tractor Supply and Menard’s have dark blue work coveralls with sleeves. They are also available from online sources. Salvation Army and other large thrift stores are a great source for a dark blue collared long-sleeved shirt and dark blue pants, be sure to check the men’s department. Land’s End online has plain dark blue shirts and pants for women and girls.